Amazing treasure is this original 5" x 7" page from a 1953 memo pad that was used as HOFer Henri Richard's first contract with the Habs in 1955! 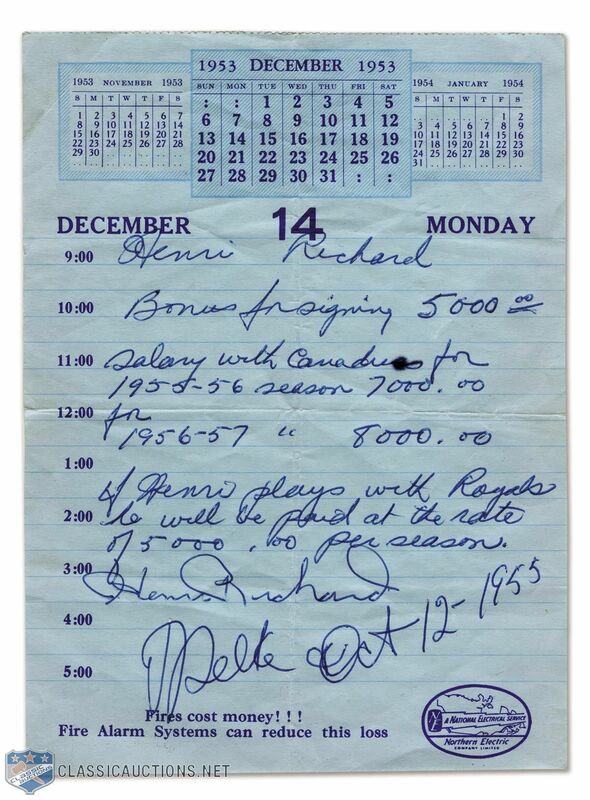 Barely 19 years old at the time, young Henri, who would ultimately be inducted into the Hall in 1979, signed this first contract of his 20-year career with the Montreal Canadiens, with it showing a $5000 signing bonus for this 2-year deal which included $7000 for his 1955-56 rookie season, and $8000 for the second season. A special clause also mentions that if Henri is sent down to the minors, he will be paid accordingly (He never went back to the minors). 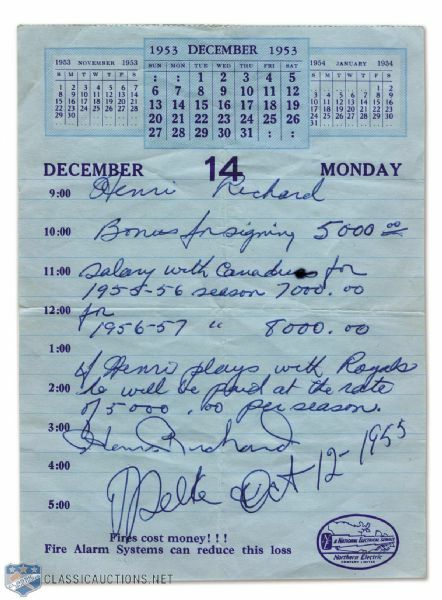 Contract is signed in clear blue ballpoint pen by both Henri Richard and GM Frank Selke and dated October 12th 1955. In excellent condition with four folds to note, along with handwriting on the reverse that states "Contrat de hockey 1955-56, 1956-57". Originally from the Henri Richard Collection, it comes with a letter of authenticity signed by Mr. Richard. Auction closed on Tuesday, June 17, 2014.